As we mentioned before Weezer is scheduled to play the Blue Album in its entirety as part of Riot Fest tonight. And it saddens us to report that former Weezer bassist Mikey Welsh, who planned to attend the show, died yesterday at a hotel in Chicago. Welsh, 40, was found unresponsive on the floor after failing to check out of his room at the Raffaello Hotel in the 200 block of East Delaware Place at 1 p.m. Saturday, according to Chicago Police News Affairs Officer Laura Kubiak. Hotel staff found him. …Tomorrow we play the RIOTfest in Chicago as planned – Mikey was planning on attending this show and we were looking forward to seeing him again. As sad as it is to think about, we know Mikey would never want the rock stopped on his account – quite the contrary in fact. While we wont see him, we know he will be there rocking out with us! As a tribute to Welsh’s impact on Weezer fans and their live concert experiences, I’d like to share this entry that Welsh posted on his Facebook page on September 27 as he chronicles the band’s return to the stage in 2000. It was early summer of 2000, and we were on our way to our first stop on the Vans Warped Tour. Weezer had started playing live again just a couple of weeks earlier, and we were all very excited to be out of the rehearsal space, and back to rocking live.. But the mood in the van was rather somber. We were about to start a two week leg of this rather “punk rock” tour, and we were all fairly convinced that we were going to get lynched. Particularly rivers. We were driving north from LA to meet up with our first date of the tour… rivers sat on the far back seat of our van, not really speaking.. pat and I were sitting together on the front bench, trying to lighten up the mood, but it wasn’t really helping.. so we finally arrived at the concert site, and out van eventually made its way back by all of the tour busses.. the mighty mighty bosstones were one of the bands on the tour, [along with green day, nofx, the lunachicks, etc…] there were two main stages, pretty much side by side… I immediately went to say hi to the bosstones guys, who I had been friends with for a long time, back in boston.. I found out soon enough that the bosstones were playing right before us, on the stage next to ours… I walked up on to the side of the stage to watch them play… the bosstones had always been a big inspiration to me when I was younger, and I was really happy to be on tour with them.. so I made my way to the side of the stage to watch them do their thing.. they got to about to the end of their third song, when I started hearing an ocean of fans chanting something.. I couldn’t really tell what they were screaming, because dicky barret was trying to talk to them in between songs… but I think dicky heard what was going on, because he suddenly looked rather agitated… then I could hear it… WEEZER WEEZER WEEZER. I was simultaneously incredibly embarrassed, and incredibly stoked.. I didn’t watch the rest of the bosstones set… I walked back to our dressing room with a huge smile on my face… now, it was time.. weezer’s first major reintroduction to the world… in front of a sea of people.. along with some of our peers.. we were led up to the stage, the crowd still chanting our name.. many heavy rockers had taken their places on the side of the stage, to watch the return of the weez… billie joe Armstrong, fat mike, my good friend joe sirois [drummer of the bosstones] they were all waiting for us… we opened with “my name is Jonas”. I was playing and witnessing a mass frenzy.. the crowd was singing louder than we were playing… rivers gave me a big smile… and all was right with the world…. How Will Fans Respond Tonight? Again, we’re saddened by this news. 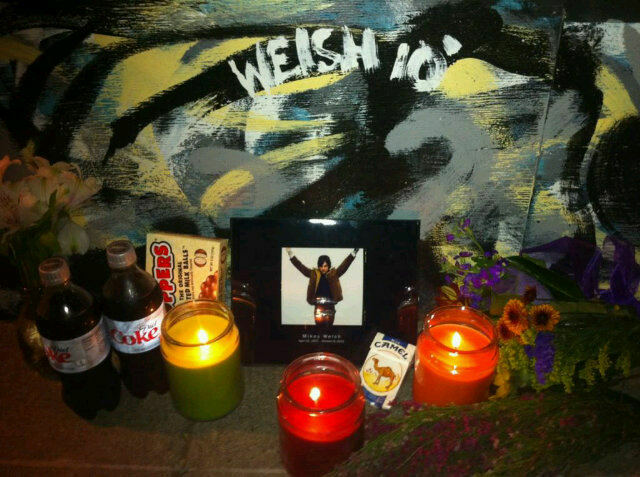 And we send our thoughts and prayers to Welsh’s family, friends and all our fellow Weezer fans. As we shared before with other artists who have passed on too soon, moments like these are highly emotional and I imagine that tonight’s show will be very palpable and raw as fans grieve and mourn Welsh’s passing in song and lyric, and recall memories of seeing him live in concert. And judging by the photo above that’s from a fan-created makeshift memorial in VT and the creation of RIP area on Weezerpedia.com, that process has already begun. We’re heading out to the show and we’ll be sure to let you know how things go. If you’ve seen Weezer before, or you’re going to tonight’s show, we invite you to drop a comment below about your experience, and we’ll share your story during a future episode of Live Fix Radio.